To get a net from a triangular prism, consider to spread all of its faces apart. For example, a triangular prism net is formed if we take off a tent and spread the tarp on the floor. This page contains many triangular prism nets for you to understand them. 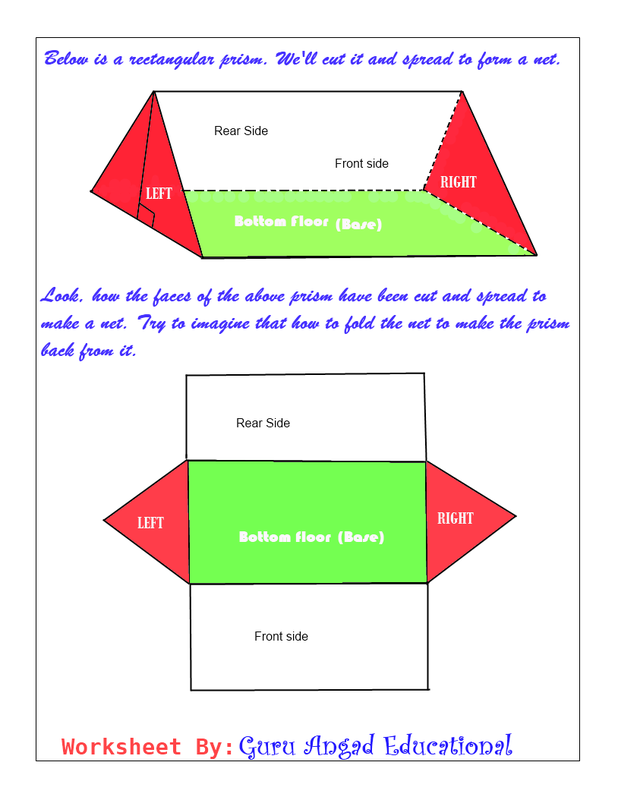 We have included the colored examples of faces of many kinds of triangular prisms and many charts of nets for you to print, so that you can get the net and fold it back into a triangular prism. A net is a very useful tool to find the surface area of any solid and so do for the surface area of a triangular prism. Students should be able to draw a net including the measurements of its edges. 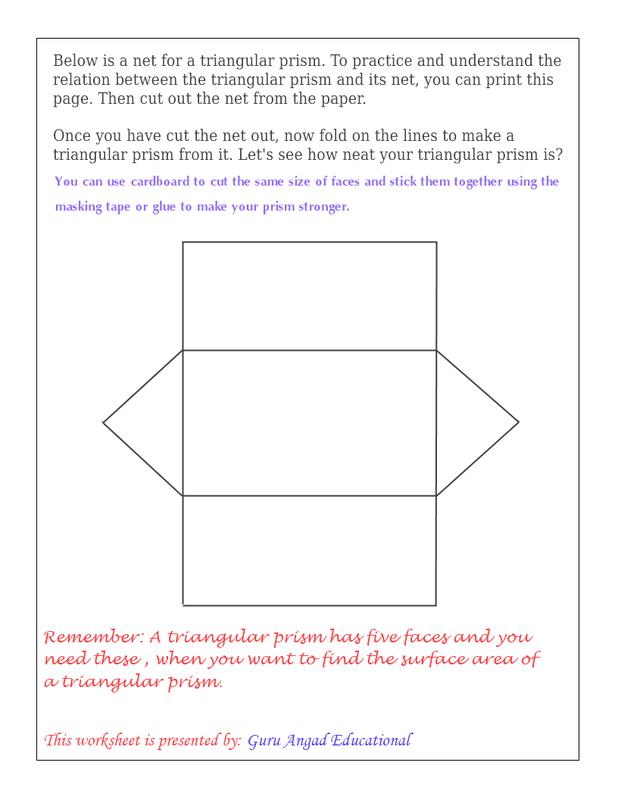 Below are the printable examples of triangular prism nets. All of the pages are in .pdf format and needed a pdf software to download these worksheets. To make it clear among students, below are key examples of triangular prism nets to print. Any of the following images can be printed for free. Again a triangular prism net is very very helpful to calculate the surface area of the prism. So, all kids should be able to draw a net by looking at the shape of a given triangular prism. In a net we can see all the five faces individually. Remember, a net is a two dimensional composite shape which consists of two triangles and three rectangles. Now, if a student knows how to find the area of a rectangle and that of a triangle, can easily find the surface area of the prism. He/she just needs to add the areas of two triangles and three rectangles obtained from the triangular prism net. 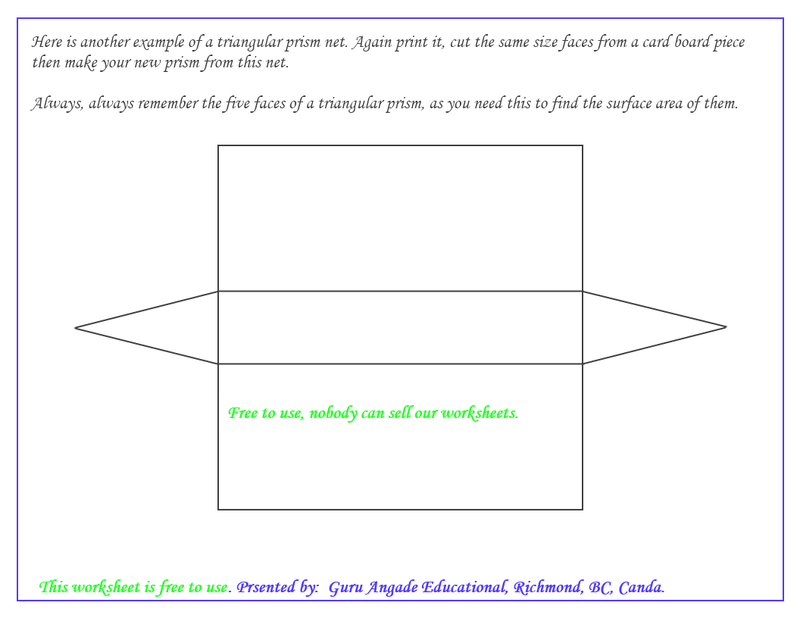 Triangular prism net printable images: Below are the images of triangular prisms and their nets you can copy paste to a word document. You are free to do so as long as the use is to educate kids and not for sale to general public. Now its your turn to draw the net of a triangular prism by looking at it. Math is a subject which needs lots of practice to master, and practice makes you perfect. Math worksheets are an excellent way to practice any of the math concepts. So, in this section we are giving worksheets on drawing nets of the triangular prisms. Below are a number of printable worksheets on this topic. Print all of them and practice to draw the net of the given triangular prisms. Learn more about triangular prism nets at this site by clicking the link.